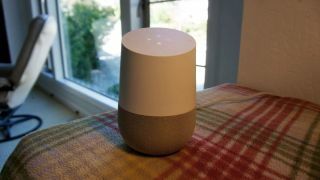 Starting today, Google Home owners can get a leg up on errands without leaving their actual home as Google's smart speaker can now shop for you with a simple voice command. Using Google Assistant, placing an order for household goods, groceries and more can now be accomplished with a simple "Okay, Google..." prompt. From there, Google Home will send those goods on their way via a number of participating Google Express retailers, which includes the likes of Costco, Walgreens, Staples, and even Pier 1 Imports - should you need a decorative reed diffuser to tie the room together, like, right now. Google adds that from now until April 30, Google Home shoppers will be exempt from any additional service or membership fees that normally come with on-demand shopping. To begin, users just need to first set up payment and shipping info via the Google Home app. It almost goes without saying that this new feature helps Google Home square up to Amazon's own Echo smart speaker, which has used its digital assistant Alexa to help customers make purchases (and even order pizza) for quite a while now. From there, it appears the next battleground for the competing home gadgets is phone calls, as a new report posits both Google and Amazon are planning to bring hands-free calling to their respective smart speakers. Amazon Echo vs Google Home - which smart speaker reigns supreme?